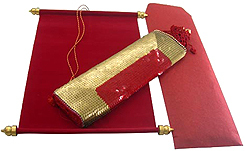 Unique Invitations and Scroll Invitations by Majestic Invites in New York, USA. Need Scroll Invitations or Unique Invitations for any event???? If you're looking for some unique invitations for your event, you've come to the right place. 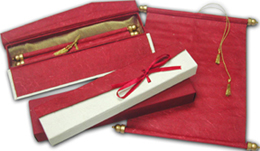 At Majestic Invites, we believe in more than ivory card stock and ebony type. We believe that your invitations should be as unique as your event. We'll work with you to create one-of-a-kind, truly unique invitations that will make you & your guests truly party inspired! We are a boutique invitations design company, committed to bringing you the very best scroll invitations, handmade & designer high-end wedding invitations, embroidered invitations, crystal invitations, event program books, personalized social stationery, and baby announcements. We specialize in providing the whole package: i.e. save-the-dates, invitations, rsvp cards, thank you notes, program books, menu cards, placecards, etc. We are proud to present a unique collection of designer wedding invitations, scroll invitations, engagement invitations, bar-mitzvah invitations, bat-mitzvah invitations, baby shower invitations, anniversary invitations, sweet sixteen invitations, quinceanera invitations, thank you cards and much more. Our handmade wedding invitation collection uses the finest papers, ribbons, and delicate handmade materials from around the world to create a wonderful mix of patterns, textures and colors to compliment your special day. All our unique invitations are customizable, and all cards and details of each invitation set can be mix and matched. That is, if you like a certain aspect of one invitation and want to mix it with the invitation from another collection, all you have to do is just let us know. We do customized orders all the time. With backgrounds in graphic design, printing, and bookmaking, we combined our efforts to offer you excellent craftsmanship, fine attention to detail, and innovative designs that reflect our passion for personalized invitations. If you are looking for Custom, Original and UNIQUE invitations for your upcoming wedding or other event, our invitations are the perfect choice. With our unique assortment of collections, we hope that you will find a design to reflect your personal style! With each product we create, our customers find invitations that are pieces of art - and quality at its best. 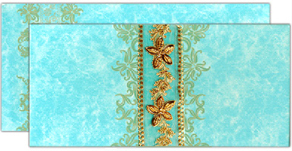 Each invitation is designed and created with an attention to detail and printed in vibrant color of customer's choice on the rarest imported handmade papers. Our products are truly geared to the minds and sensibilities of our sophisticated customers who want only the finest things in life. Past customers include A-list celebrities, VIPs and royalty. Since 1998, Majestic Invites has been creating unique invitations. Our wedding, engagement, business and social invitations are created with ultimate care. Our invitations have been featured in The New York Magazine, The Knot, Martha Stewart, Modern Bride, Hamptons Magazine, Wedding Channel and Biz Bash event planner magazines. We are also the recipient of the 2005 Idea Factory Award and Cisco 2006 Technology Award. MajesticInvites.com releases an interview discussion with the owner about the latest trends in wedding invitations and corporate invitations. Find out what's hot in invitations in 2008 and what makes invitations unique.